A part of New York City, Riverdale is situated along the banks of the Hudson River, just 12 miles from midtown Manhattan. You’ll find quiet neighborhoods and lively commercial areas with movie theaters, shops, and restaurants—a perfect complement to our idyllic campus. The Mount’s ideal location truly offers the best of both worlds. 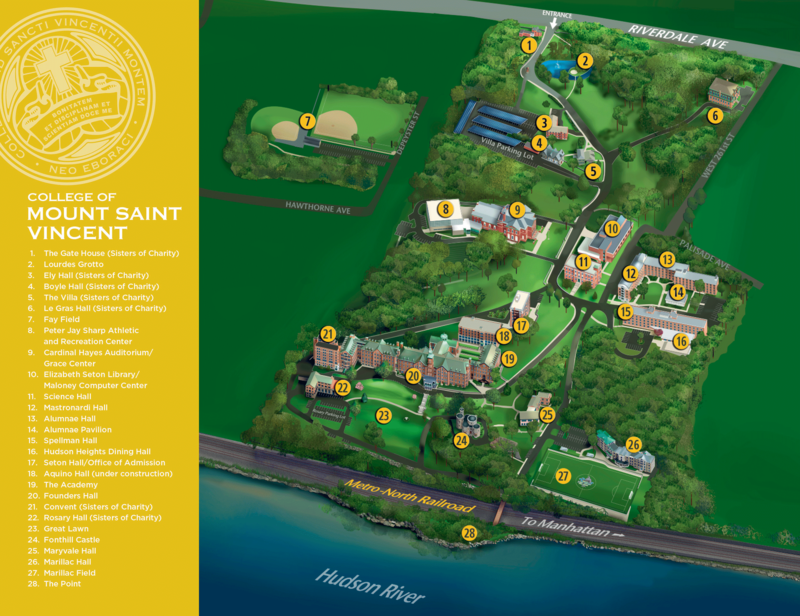 The College of Mount Saint Vincent is located at 6301 Riverdale Avenue, Riverdale, N.Y., 10471. 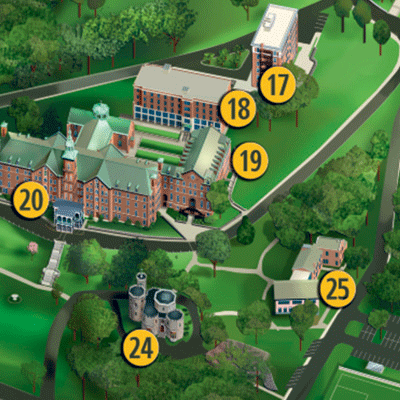 Click the image to view the full version of the campus map. Take the George Washington Bridge. Exit for Henry Hudson Parkway North. Northbound, take Exit 22, West 253rd Street. Turn right at the stop sign and bear right over the parkway to Riverdale Avenue. Follow Riverdale Avenue to 263rd Street. Turn left into the campus. Head north on Manhattan’s West Side Highway to the Henry Hudson Parkway North. Northbound, take Exit 22, West 253rd Street. Turn right at the stop sign and bear right over the parkway to Riverdale Avenue. Follow Riverdale Avenue to 263rd Street. Turn left into the campus. Take the Throgs Neck or Whitestone Bridge to the Cross Bronx Expressway. Exit at Rosedale Ave/Bronx River Parkway. Take the Bronx River Parkway North to the Mosholu Parkway. Turn right at the light and take the Mosholu to the Henry Hudson Parkway South. Take Exit 22, West 254th Street. Turn left at the stop sign and continue one block to Riverdale Avenue. Turn right and follow Riverdale Avenue to 263rd Street. Turn left into the campus. Or, take the Triboro Bridge to Major Deegan Expressway to Exit 11, Van Cortlandt Park South. Bear right off the expressway to Broadway. Turn right on Broadway to 261st Street. Turn left on 261st Street to Riverdale Avenue. Turn right and follow Riverdale Avenue to 263rd Street. Turn left into the campus. Take the NY State Thruway, the Taconic State Parkway, Sprain Brook Parkway, Bronx River, or Hutchinson River Parkway South to the Cross County Parkway West. Continue to the Saw Mill River Parkway South to the Henry Hudson Parkway South. Take Exit 22, West 254th Street. Turn left at the stop sign and go one block to Riverdale Avenue. Turn right and proceed north on Riverdale Avenue to 263rd Street. Turn left into the campus. Learn about the Riverdale campus parking locations and vehicle regulations. Please note: During the Fall and Spring semesters, you can take the Mount’s shuttle bus to the Van Cortlandt and 242nd Street 1 train stop. A train (to Inwood – 207th Street), walk to Broadway and Isham Street, then take the Bx7 bus to Riverdale Avenue and 263rd Street. Local Bronx Buses: Bx7 and Bx10 pick-up and drop-off at the campus gate (Riverdale Avenue at 263rd Street). Manhattan/Riverdale Express Buses: BxM1 and BxM2 pick-up at Riverdale Avenue and 261st Street and drop-off at the campus gate (Riverdale Avenue and 263rd Street). View NYC Subway and Bus Schedules. From Westchester County: Change at Getty Square in Yonkers for the College of Mount Saint Vincent #8 bus. View the Beeline Bus Schedule.